We stopped off at Archil Guniava Wine Cellar on our way from the south of Georgia to Kutaisi. This was the first producer visit on our tour of South and West Georgia and we did not know what to expect. Archil’s place is located a few kilometres from the town of Zestafoni, off on a narrow road with rural houses strung out on both sides, and part of a settlement that goes under the name of Kvaliti. The already narrow road got even narrower. At one point our driver asked for directions and was told “keep going until the road ends, and it’s on your right”. This is about as rural as you could get whilst still being in the presence of houses. 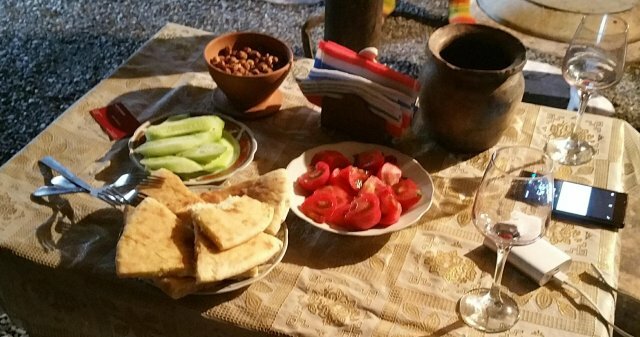 On arrival, we were invited into the marani, a qvevri-containing cellar. It was the afternoon, and we had had a heavy lunch, but of course we were offered more food – enough to have served as a lunch on any normal day. In addition to the obvious cucumber and tomato shown below, there is a bowl of hazelnuts, and the bread you see at the front of the image is khachapuri. Sadly, after the lunch even I was not able to make much of an impact on what we were given. Although Archil worked in forestry, and still does, he comes from a family that was in previous generations well known for selling wine locally. So Archil now uses the family marani and qvevri, and his daughter makes wine there too. 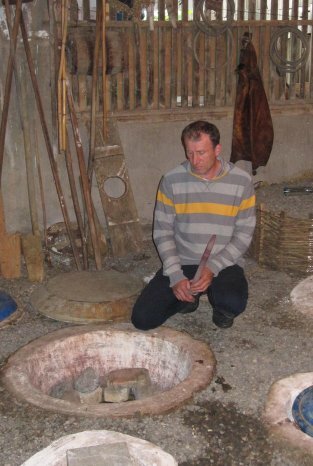 Compared with artisinal winemakers we met who have lived and worked in Tbilisi, Archil seems to be much more rooted in his village and his family’s winemaking heritage, and is maybe less subject to external influences. I read for example that he first learned about cultured yeast for winemaking only a few years ago (not that he uses it now, of course), and he still finds it strange that people like us want to visit and buy his wine. It is indeed strange when you think about it, but what of the wines we tasted? They were all from 2017, and moved directly from qvevri to tasting-glass using a pipette. They are identified below by grape variety. These wines are not yet available in the UK, but will be imported by Proper Natural Wine. I personally imported one bottle each of Mgaloblishvili and a Tsolikouri Tsitska Krakhuna blend, both 2016. This entry was posted in My tasting notes and tagged georgia, qvevri, travel. Bookmark the permalink.